Do not exceed 6V. Do not use two rechargeable CR123A. To switch between output levels, (with light turned on) press and hold the on/off switch for longer than 0.6 second to switch to next output. Press and hold the switch will cycle between all levels. Reduces output by 15% after 200 seconds at turbo mode. Ensure the protective circuit on the 18650 batteries has current limitation of higher than 5A. Always use proven SPORTAC batteries for best performance and reliability. For rechargeable li-ion battery, use only SPORTAC li-ion battery, or other protected li-ion battery with compatible length and diameter. Before using the battery, check and ensure the battery outer wrapping (the isolating plastic film that wraps around the metal housing of the battery) is complete. 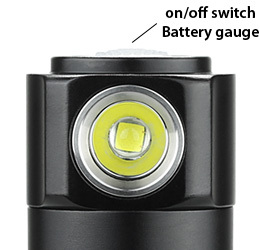 Broken battery wrapping may lead to short circuit and damage to the flashlight. SPORTAC CR123A high performance lithium battery. 1500mAh capacity. PTC protected. Upgrade to XM-L2, XP-G, Color, UV 365nm-370nm, 395nm-400nm, IR 850nm. SPORTAC 18650 high performance li-ion rechargeable battery. 3100mAh capacity. IC protected. Japanese made cells. ANSI FL-1 Lumens is a measurement of light output standardized by American National Standards Institute for use with flashlights. This ANSI Lumen measurement is the total overall light output being emitted from the flashlight. This measurement is generally more accurate as it takes into consideration the loss from reflector/lens/bezel. 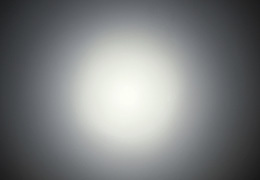 SPORTAC’s ANSI Lumen output is measured using a calibrated integrated sphere three minutes after turning on the flashlight. For O.T.F. lumen, measurement is taken one minute after turning on the flashlight. Energy saving feature reduce the maximum output current from 100% to 85% after 200 seconds at turbo output. 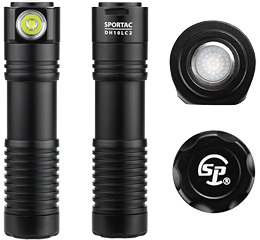 Runtime is measured with energy saving feature enabled using three SPORTAC 3400mAh batteries. Copyright 2009 - 2015 SPORTAC LLC. All rights reserved.